Improved technology meets a spinning reel icon in this rebirth of the popular graphite-bodied Penn Spinfisher SS series. 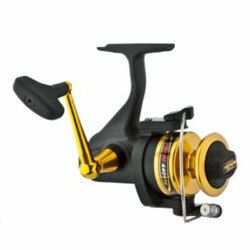 The Penn Spinfisher SSg Series Reels' advanced features include: five stainless steel ball bearings plus an Infinite Anti-Reverse roller bearing; Techno-Balanced rotor; Leveline spool wrap system; lightweight, ergonomically contoured frame; stainless steel main shaft; sealed drag knob; Penn Power Drag; gold-anodized, machined handle; fail-free bail spring. "This is an incredible reel. I have had the 440 for 3 years now and it feels like I have just taken it out of the box. The drag is very smooth when being screamed out by big reds and sharks. Great buy"
"I bought this reel in the 440 and 450 sizes two years ago. The 440 is on a 7' ugly stik lite medium actionand the 450 is on a 7' ugly stik heavy action. I use them both off my boat and on my kayak. Right after I bought them, I went out to Taylor's creek in Beaufort, NC and was going to do some fishing out of my kayak. " "I bought this reel at my husband's request for his Christmas present. He has another Penn reel that he has had for seven years, is well used and still going strong. This one replaces a reel that has seen better days, so now he's set with 2 Penns!"